Guidon Fat-Bar Custom Yamaha (XVS 650 Drag Star Classic - XVS 1100 Drag Star et Classic - XVS 950 Midnight Star - XV 1600 Wild Star) Fat Wishbone Highway-Hawk Fat-Bar 32 mm Custom Chrome. - Guidon Fat-Bar Fat Wishbone (32 mm/25 mm) Custom Chrome pour Yamaha XV 1600 Road Star. - Diamètre du Fat Wishbone : "Fat-Bar" 32 mm sauf cotés (pour vos Commodos) diamètre 1" (25,4 mm) : Guidon Chromé pour Yamaha Custom avec Poignées et Commodos en 1" (25,4 mm). Pur Esprit Custom. 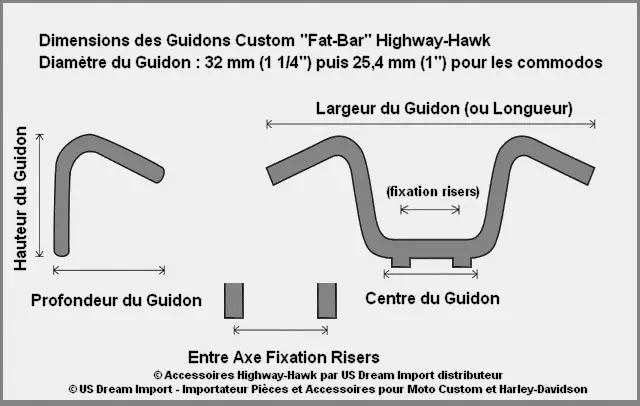 Guidon Fat-Bar (Grosse Barre de 32 mm) pour Custom Yamaha XVS 650 Drag Star Classic XVS 950 Midnight Star XVS 1100 Drag Star et Classic XV 1600 Wild Star Fat Wishbone Highway-Hawk Fat-Bar 107 cm Custom Chrome.